Kabindra (Swami Prem Maneesh) has formally studied yoga and the teachings of Yoga at various institutes including at the Bihar School of Yoga in India, since 2007. 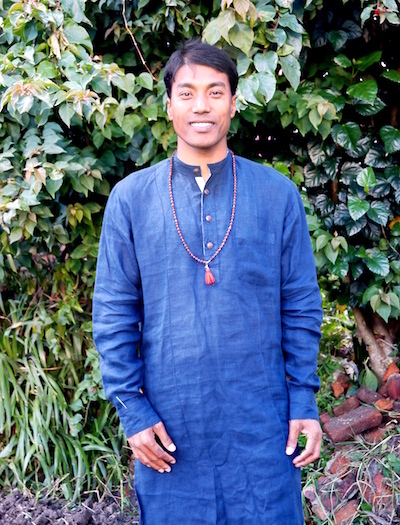 He completed his 200hrs Yoga Teacher’s Training with the Himalayan Yoga Academy (registered with Yoga Alliance), and holds a diploma in Yoga & Naturopathy from Nepal Sanskrit University (Balmiki Campus). Having completed Reiki III A and B (Master Degree) under the initiation and instruction of Dr. Yogi Vikasananda, Kabindra is inspired by the teachings of Osho and became Neo Osho Sannyasin in 2009. He has had the opportunity to learn, teach, and apply a variety of meditation techniques such as Dynamic meditation, Kundalini Meditation, Vipassana meditation, and Transcendental Meditation. Prior to joining Kamala Yoga Nepal, Kabindra worked as a Yoga Teacher for Yoga schools (the Milliennium International Academy and the Supreme Academy), and from 2012 to 2017, as a dedicated residential Yoga Teacher at the award-winning Begnas Lake Resort and Villas, Pokhara. In his free time, Kabindra enjoys reading and travelling. He also enjoys playing music with others and singing. He has chosen to dedicate his life to the teachings of yoga, and prefers to live simply, relying on few necessities only.